The EU is well-placed to play a positive role in managing the region’s flashpoints. The European Union (EU) is a very important economic actor in Northeast Asia. It is China’s biggest trading partner, the third largest for Japan and the fourth most important export destination for South Korea. However, the EU is glaringly absent from discussions regarding regional security and how to deal with North Korea’s missile and nuclear threats. The EU possesses various soft security assets that could make a distinctive contribution to regional cooperation and trust-building – yet, these assets are largely unknown and underutilized. They should warrant, instead, serious consideration as they could help the region’s policymakers to address North Korea’s increasing provocations as well as mounting nationalism which put at risk Northeast Asia’s peace and stability. Northeast Asia is today one of the world’s most dynamic economic areas, accounting for almost half of all global growth. Yet, relations between China, Japan and South Korea are strained due to a variety of issues, ranging from World War II apologies and the interpretation of history to territorial disputes between the three nations. Moreover, North Korea’s missile and nuclear programs continue to be a threat to regional peace. Pyongyang has launched more than 30 missiles since 2015, while administration of U.S. President Donald Trump has aired the idea of preemptive strikes against North Korea’s military installations. Washington has also begun the deployment of the THAAD system in South Korea, straining relations with China, which sees the missile shield as a game-changer for the region’s strategic balance and its own military capabilities. Moreover, Tokyo and Seoul are under pressure to increase their defense capabilities to face Pyongyang’s growing threat. There is still the possibility that dialogue will prevail over the use of force and that harsher sanctions will convince Pyongyang to resume talks over its ballistic and nuclear programs. If this does not happen, the United States and its Asian allies will either have to adapt to a nuclear North Korea, or take resolute action to accelerate the demise of Kim Jong-un’s regime. No matter the outcome of the current crisis, Northeast Asian policymakers need to devise ways to live together and cooperate so as to ensure that the economic growth and prosperity which has characterized the region in the last decades will continue. A growing body of work maintains that peace and security are inextricably interlinked with the deepening of regional cooperation and trust building. Northeast Asia is a region with a low level of institutionalization of these concepts. The U.S. is the guarantor of regional stability, yet the Trump administration shows contempt for multilateralism and institutions, preferring bilateral bargaining and power relations instead. This leaves the European Union as the only global actor that continues to promote regional integration, multilateralism and trust building. The EU is untrammeled by binding military alliances in Northeast Asia. The drive for integration and reconciliation is also very much part of Europe’s “DNA,” while also being one of its foreign policy objectives, as stated in the EU Global Strategy. For this reason, the EU has unwaveringly supported South Korea’s Trust-Building Process on the Korean Peninsula, as well as the Northeast Asia Peace and Cooperation Initiative (NAPCI) put forward by former South Korean President Park Geun-hye. The EU is the staunchest supporter of trilateral cooperation based on the annual Trilateral Summit of the heads of state and government of China, Japan and South Korea. The Trilateral Summit was first proposed by South Korea in 2004, as a meeting outside the framework of the ASEAN + 3 (the Association of Southeast Asian Nations plus China, Japan and South Korea) – itself a by-product of the Asia–Europe Meeting (ASEM) – with the three major economies of Northeast Asia having a separate forum to themselves. The first summit took place in Fukuoka (Japan) in December 2008 when the three countries met to discuss regional cooperation, the global economy and disaster relief. Since then, they have established more than 60 trilateral consultative mechanisms, including almost 20 ministerial meetings and over 100 cooperative projects. In September 2011, the Trilateral Cooperation Secretariat (TCS) was launched: based in Seoul, the TCS is an international organization whose goal is to promote peace and prosperity between China, Japan and South Korea. On the basis of equal participation, each government covers one third of the overall operational budget. From 2012 to 2015, however, no Trilateral Summit took place due to separate disputes over historical grievances as well as maritime territorial claims. Nevertheless, the process has continued at the ministerial, business and civil-society levels, indicating that important sections of the three societies remain committed to regional cooperation and trust building. On November 1, 2015, the sixth Trilateral Summit was held in Seoul, during which Chinese Premier Li Keqiang, Japanese Prime Minister Shinzo Abe and South Korean President Park Geun-hye agreed to deepen trade relations and to pursue the Six-Party Talks (SPT) over the DPRK’s nuclear-weapons program. Since then, however, no further summits have taken place. This has not hindered the EU’s behind-the-scenes work to keep the trilateral process rolling. On August 2, 2017, for instance, the EU Delegation in Seoul invited young students who were participating in the Young Ambassadors Program organized by the Trilateral Cooperation Secretariat to a workshop (funded by the EU) with the aim to promote mutual understanding and the sense of friendship among future leaders of South Korea, Japan and China. The EU does all these things to promote its values, as well as defend its growing economic interests in the area. Almost a fifth of the EU’s global external trade occurs with Northeast Asian countries, with which bilateral agreements have already been signed or are being negotiated. In 2010, Seoul and Brussels signed a Free Trade Agreement (FTA). In July 2017, the EU and Japan formally agreed an outline free-trade deal. In November 2013, Brussels and Beijing opened negotiations on a bilateral investment agreement that – if successful – could pave the way for an FTA. It is, therefore, in Europe’s strategic interest to support cooperative and peaceful relations among Northeast Asian nations. The EU’s contribution to regional security has mainly taken the form of support for international, multilateral fora. For instance, with the establishment of the Asia–Europe Meeting (ASEM) in 1996, a “track-two” has been initiated that also includes a multilateral security dialogue on various levels between the EU and Asia. At the ASEM-3 in Seoul in 2000, both the EU and Asian nations stated their explicit concerns with regard to the security situation on the Korean Peninsula, issuing the Seoul Declaration for Peace on the Korean Peninsula in which they supported implementation of the South–North Joint Declaration, including humanitarian issues. Back in September 1997, the EU, through the European Atomic Energy Community (EURATOM), became a member of the Korean Energy Development Organization (KEDO), created to implement the denuclearization of the Korean Peninsula. Until 2006, the Union – through the European Commission – was a member of the Executive Board of KEDO, whose goal was to construct two light-water reactors to replace the North Korean graphite-moderated reactor and reprocessing plant at Yongbyon, which had been producing a large amount of plutonium. The aim of the KEDO project was clear: to deter further nuclear proliferation and to maintain peace and stability on the Korean Peninsula. From 1997 to 2006, the total amount invested by the EU in the KEDO project reached almost 120 million euros. 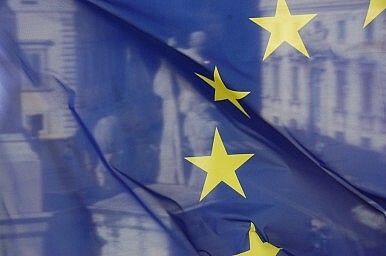 In May 2001, the EU established diplomatic relations with the North Korean regime. Today, many EU countries entertain official ties with North Korea. Since 1995, over 370 million euros in aid has been provided in the form of food aid; medical, water and sanitation assistance; and agricultural support. In 2011, the EU provided 10 million euros in emergency aid following a severe food crisis in the North. Concurrently, the EU and its member states have adopted sanctions against Pyongyang following the country’s 2003 decision to withdraw from the Non-Proliferation Treaty (NPT) and the nuclear tests in 2006; 2009; and, more recently, in 2016 and 2017. Recent sanctions against the North Korean regime have taken place within a context of growing political and security ties between the EU and its strategic partners in the region. Europe is mainly a civilian power in Northeast Asia. The EU does not have troops or military alliances in the region. However, some EU member states have retained a certain level of military involvement in the region. France, for instance, has an operational military presence in the Indian Ocean and the South Pacific, with troops that can be deployed in Asia at relatively short notice. Some EU member states collaborate with Japan and South Korea via the NATO framework – while France, Germany, Italy and Spain have developed bilateral security and military ties with China, including joint military exercises involving humanitarian assistance and disaster relief, search and rescue, and medical response. Moreover, the EU is developing space and satellite-navigation capabilities (mainly civilian) in the Asia-Pacific region. The EU signed an agreement for the joint development of Galileo (the EU-led global navigation-satellite-system alternative to the American GPS) with China in 2003 and with South Korea in 2006, while cooperation with Japan occurs mainly at the industrial level. Galileo became operational at the end of 2016. The satellite network’s ground stations are currently being developed across the Asia-Pacific region in EU territories (mainly French Polynesia), while discussions are under way with the Asian partners in the Galileo project for building joint ground stations and receivers. Besides the commercial dimension, Galileo allows the EU to promote its own civilian-controlled satellite network that could continue to operate even if the GPS (which is Pentagon-controlled) is switched off. This form of cooperation allows the Union to establish a foothold in the region’s evolving space relations, with its related security implications. Following the creation of the European External Action Service (EEAS), it is now possible for Brussels to engage Northeast Asian nations in a way that would have been unthinkable only a few years ago. For instance, since 2010 there is an EU–China High Level Strategic Dialogue between the High Representative of the Union for Foreign Affairs and Security Policy (HR) and the Chinese State Councillor responsible for foreign affairs. Since 2011, there is also a yearly meeting between the EU’s HR and the Chinese Defense Minister, paralleled by a dialogue on military affairs between the Chair of the EU Military Committee and his/her counterpart in the People’s Liberation Army (PLA). In March 2013, the EU and Japan launched negotiations for a Strategic Partnership Agreement (SPA) which aims to upgrade political and security-related relations between the two. The SPA is currently being finalized, after the two sides formally agreed an outline free-trade deal in July 2017. Since 2011, an EU–Korea High-Level Political Dialogue has been in place between the EEAS Deputy Secretary-General and South Korea’s Vice-Foreign Minister. South Korea is also the first Asian nation to have signed in 2014 a Framework Participation Agreement (ratified by Seoul in 2016) aimed at facilitating the Seoul’s participation in EU Common Security and Defense Policy (CSDP) missions and operations. Finally, the EU also has an annual political dialogue with Pyongyang – part of the Union’s policy of critical engagement towards North Korea. In the last years, the EU has developed a strategy for nonproliferation and disarmament, and acquired first-hand experience in negotiating with Iran and in convening the group of the P5 + 1 countries – a format that has many similarities with the Six-Party Talks. The framework agreement on the Iranian nuclear issue reached by the P5 + 1 – i.e. China, France, Russia, the United Kingdom, and the United States plus Germany – with Tehran in July 2015, and the role played by the EU in the negotiations, have given Brussels the confidence, and ability, to eventually play a role in resuming talks on the North Korean nuclear dossier – if the concerned parties so wished. The Europeans could bring to the table the European Commission’s previous involvement in the KEDO project. Europe’s experience of the joint, and safe, management of nuclear resources, as in the case of EURATOM, could also provide useful tools. The Helsinki Final Act – signed in 1975, at the height of the Cold War – shows that cooperation is possible even with an enemy armed with nuclear weapons. Northeast Asia could benefit from a regional, multilateral security organization such as the Organization for Security and Co-operation in Europe (OSCE) as a primary instrument for early warning, conflict prevention, crisis management and post-conflict rehabilitation. The ‘civilian’ image of the EU makes it a well-suited actor to promote regional cooperation and trust building – through mediation, dialogue and capacity-building measures. Europe’s soft security assets warrant serious consideration as they could help the region’s policymakers to devise a peaceful future for Northeast Asia. Nicola Casarini is Senior Fellow and Head of Research Asia at the Istituto Affari Internazionali in Rome and Global Fellow at the Wilson Center in Washington DC. He is the editor of the book: Promoting Security Cooperation and Trust Building in Northeast Asia. The Role of the European Union (July 2017). Northeast Asia's Diplomatic Status Quo PersistsThe Diplomat's East China Sea ADIZ Analysis Round-UpThe Battle for Influence in Southeast AsiaChina and Japan's Cyber Détente"North Korea could conduct a third nuclear weapon test within as little as two weeks..."